The kitchen is changing. No longer is it simply the room where food is cooked and eaten. In many homes, the kitchen is now a “great room” that combines food-prep spaces, casual eating areas, workspaces, and a family room in a large, open-plan layout. As the kitchen changes, so too must its appliances. In the past, we expected little more than functionality from the refrigerator, dishwasher, and range. 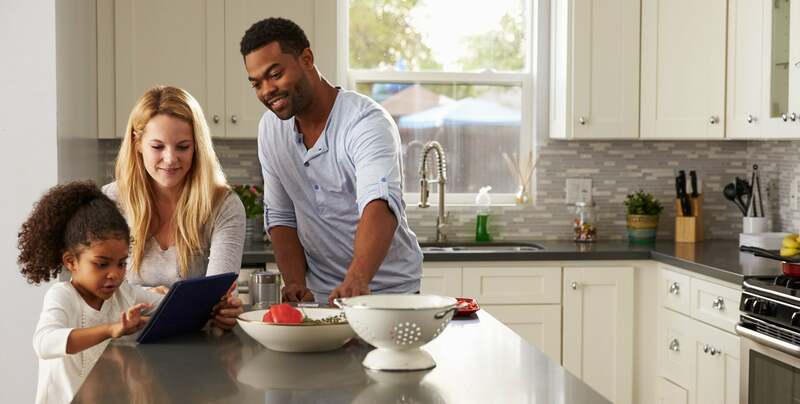 But now, as the kitchen becomes a room for living, and not just cooking, appliances must contribute style and aesthetics to the kitchen’s design as well as facilitating food prep and cleanup. One of the ways appliances can add style to a kitchen is with the addition of cabinet fronts. For example, panels constructed with the cherry, mahogany, or maple used in the kitchen cabinetry can transform a refrigerator from a hulking appliance to a handsome piece of furniture. Cabinet-fronts allow appliances to blend in seamlessly with their environment. Only you’ll know what’s hidden within. As for dishwashers, you can camouflage a standard model with a wood panel—or you can choose to include one or more drawer-style dishwashers that not only enhance your kitchen’s design but add features that go way beyond what old-style dishwashers can deliver. “Dishwasher drawers look like drawers, not appliances,” O’Rourke says. Drawer-style dishwashers came onto the kitchen scene about 20 years ago, after designers at Fisher & Paykel in New Zealand spent time observing families in their kitchens. “We could see living patterns changing—home cooking was getting more casual, socializing less formal,” says Mark Elmore, head of design at F&P. “At the same time, the design of the kitchen was becoming more open. 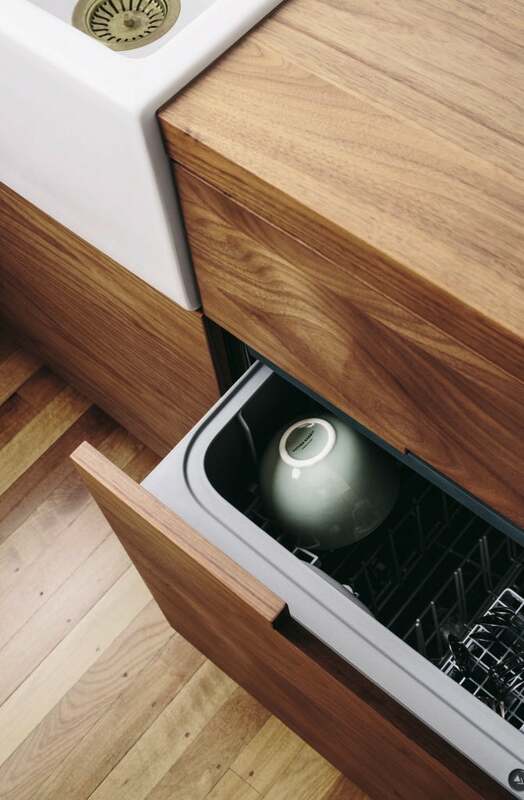 There was a shift away from deep under-counter cabinets to drawers that were beautifully engineered to slide out.” Years of designing, testing, and refining followed that ah-ha moment, and today, F&P’s ninth-generation DishDrawer Dishwasher offers homeowners style, convenience, and functionality. “When the dishwasher drawer first came out, it was kind of revolutionary,” says Cassia Wyner, owner of CW Design LLC in Brookline. The inconvenience of loading a standard dishwasher was also on the minds of F&P designers when they created the drawer-style dishwasher. “We thought, drawers slide out at an ergonomic height, so why can’t dishwashers? Why can’t dishwashers be more like a cutlery drawer, so that loading takes one step, rather than opening a door and sliding the tray out?” Elmore says. Not only is it annoying to have to bend down and load a standard dishwasher, but while you’re loading it the door must stay open, obstructing kitchen traffic and placing racks full of dirty dishes on full display—not a pretty sight, especially when you’re entertaining. With kitchens increasingly serving as living areas, it’s more important than ever before that dirty dishes stay out of sight and don’t pile up in the kitchen. Having two drawer-style dishwashers helps the dish-cleaning process go smoothly. “The beauty of dishwasher drawers is that you can run smaller, more-frequent cycles of cleaning as opposed to waiting for the whole dishwasher to fill up,” Sayeed says. The convenience of drawer-style dishwashers doesn’t end in the kitchen—they are also popular as supplementary dishwashers in pantries and wet bars. “In a typical bar or pantry area, you may just need a small dishwasher—you’re mainly washing glassware or dessert plates,” Wyner says. 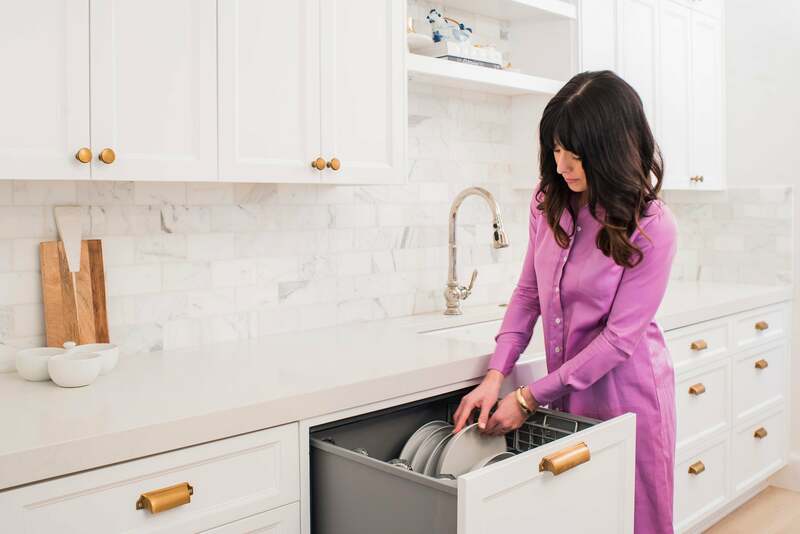 Whether your kitchen is a bustling great room filled with people and activity, or a tiny space with only a few dirty dishes, a dish drawer could be the stylish, ergonomic solution to your dishwashing needs.